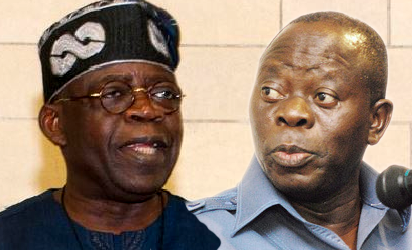 IlorinNational Leader of All Progressives Congress, APC, Asiwaju Bola Tinubu, and Party National Chairman, Comrade Adams Oshiomhole, yesterday in Ilorin, asked the people of Kwara State to use the forthcoming general elections, starting from Saturday to break the hold of Senate President Bukola Saraki, and regain their freedom. President Buhari, in his remark, also said proceeds recovered from looters would be invested in infrastructure development of the country, saying we are going to continue to take those who abuse trust before the law; collect what they have stolen and invest it in infrastructure. I assure you that the undertaking we made in 2015 on the three major issues APC believes in (security, economy and fight against corruption), we have not failed. Wherever I go I repeat myself on these issues to remind you where this country was before we came in, where we are now and what we are able to do with the resources that are at our disposal. The people of the North-East as far as security is concerned, are major witnesses of our performance. On the economy, we thank God the three previous rainy seasons were good. We made fertilizers available at reduced prices. People are now back to the farms and nobody regretted it. We are able to ensure food security and people are living respectable lives. In fighting corruption, we are not going to give up. On his part, Tinubu said Kwarans had over the years, been held captive by Bukola Saraki, saying this is celebration of Kwara States freedom. It has been long that they have been swindling your collective patrimony. We are not here for conspiracy. We are not here to quarrel with the Saraki dynasty as Gbemisola Saraki is with us. She is a scion of the Sarakis. We are here to reject over lordship. We are here to say no to Bukolas enslavement. He is a betrayal. We are chastising Bukola Saraki. This is the celebration of the fall of Berlin Wall. This is the celebration of the end to oligarchy; the emperor that has been existing for years. Similarly, Oshiomhole said: For Bukola, it is finished. I cannot wait till Saturday for Kwara people to celebrate their new found freedom. Next articleWhich way, Nigeria? 4+4 or 4-4?